It’s a question where you really can’t lose. Given the choice, what would be your best spot at Pinehurst to watch the NCAA Tournament? Your choices? The new Pinehurst Brewing Co., or the Deuce. But even if it’s a no-lose situation, it’s not necessarily an EASY answer, either. So, with that in mind, let’s run through a scouting report for each to see if we can determine which locale might offer the best experience. The Deuce offers a wide variety of signature cocktails. Deuce: Oh, boy, where to start? The Deuce has 10 Signature Cocktails, and that doesn’t even get into the barrel-aged specialty cocktails. They have names like North & South, Slice, Divot, Bump and Run and Tea’d Up. They have descriptions like, “Our own barrel-aged Crown Royal Regal Apple whisky, sweet vermouth and apple juice are served over an ice sphere and garnished with an apple slice and a black cherry (the North & South). Oh, and there are several craft beers of tap, including PBC beers. Whew. PBC has six original beers on tap this weekend. PBC: Are you kidding? Check out the Beer List. And you better come in quickly, because PBC can kick kegs like few places in the area can. A lot of that has to do with what head brewer Eric Mitchell is doing on a consistent basis, and right now, we’re tapping two of the most popular beers since PBC opened in September – the Pivot IPA and the Golden Age American blonde ale. Six Pinehurst beers are currently on tap, including the 12.7 ABV imperial stout, the Malavisco. Deuce: The early games of the Big Dance mean you can hit the Deuce buffet for lunch, or any of the dazzling entrees on the lunch menu. Coming later? Then choices from the Bar Menu still include sliders, huge sandwiches and burgers and apps like the wings, Taterman Tots, Tin Whistle Nachos and pretzel bites. Dig in. Chris Dowd, the Pitmaster for PBC. PBC: Beef brisket. Pulled pork. Ribs. Chicken. All smoked all day at the smokehouse out back. Pizzas, beer cheese and smoked wings. Enough said? The 18th Hole of No. 2 is RIGHT THERE. PBC: OK, yes, you may have to wait. It’s kinda been a thing. But that’s what the Beer Garden is for. Two large screen TVs, a full bar and several tables are under the trellis in the shadow of the rebuilt smokestack. It’s communal. It’s fun. Good Dogs are welcome. It’s a party, y’all. Deuce: It’s been three years since the Deuce opened, and with PBC garnering a lot of headlines lately, it can be easy to forget how cool the Deuce is. Let’s make sure we say this again: Pinehurst No. 2 is RIGHT THERE. Outside the Deuce, the large veranda offers soft seating and tables for dining. The TV on the veranda is huge, and there are a lot of commercials during tourney games. But No. 2 is RIGHT THERE. Much of the Village’s old steam plant was salvaged and reused throughout the PBC. PBC: The steam plant was built in 1895, providing power to Pinehurst’s first hotel, The Holly Inn, and the first cottages of the Village. The brick façade is original, and the walls inside the brewhouse are still blackened from the massive boilers that used to be inside. Look everywhere and you’ll see something that was salvaged from the original plant, whether it’s under your feet, above your head or on the walls. The beer is new. The place is old. And you feel every bit of that history. The call: Choose one for Thursday. Choose the other for Friday. Repeat as necessary through the weekend. And through the tournament. So, once more, what’s your vote? 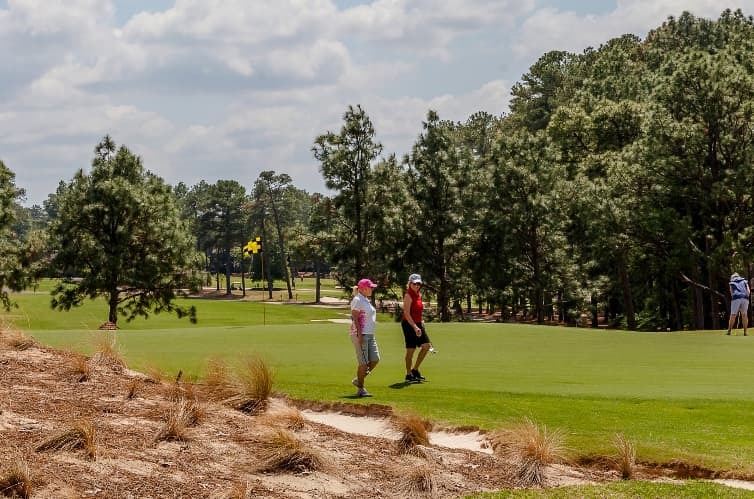 We want to know: What’s the best spot at Pinehurst to watch the #NCAATournament?